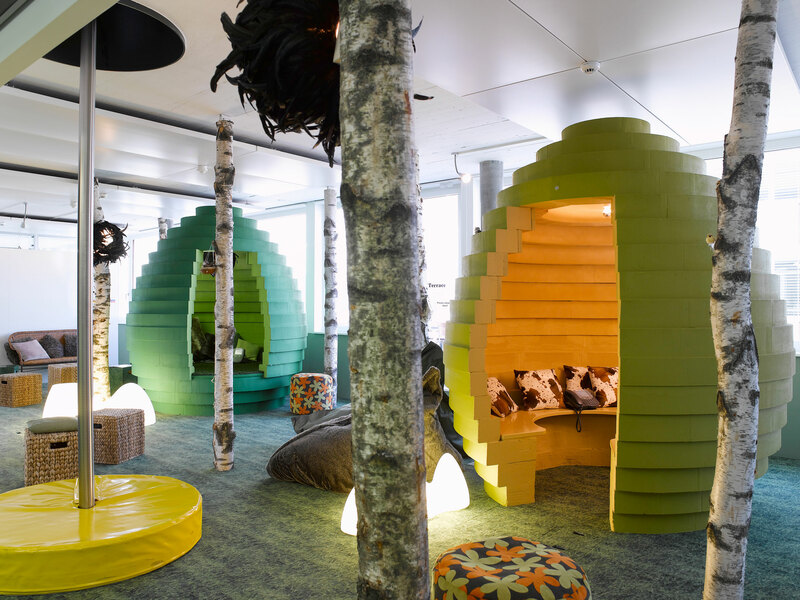 By being incredibly innovative, flexible and tailored for the particular needs and culture of the company and its employees, Google’s EMEA Engineering Hub in Zurich, Switzerland, is a great example of a modern workspace design, which cultivates an energized and inspiring work environment that is relaxed but focused, and buzzing with activities. 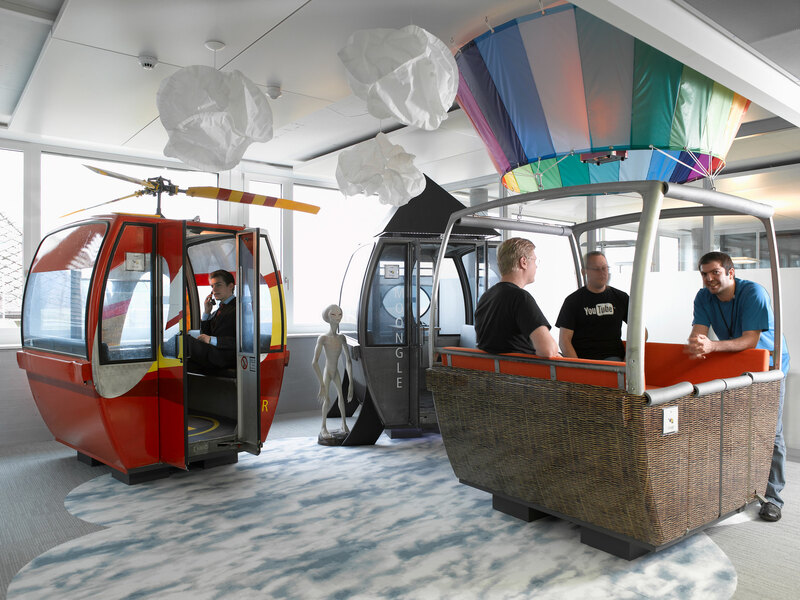 At the time of completion in 2008, this office was one of the early examples of the future workplace design development. 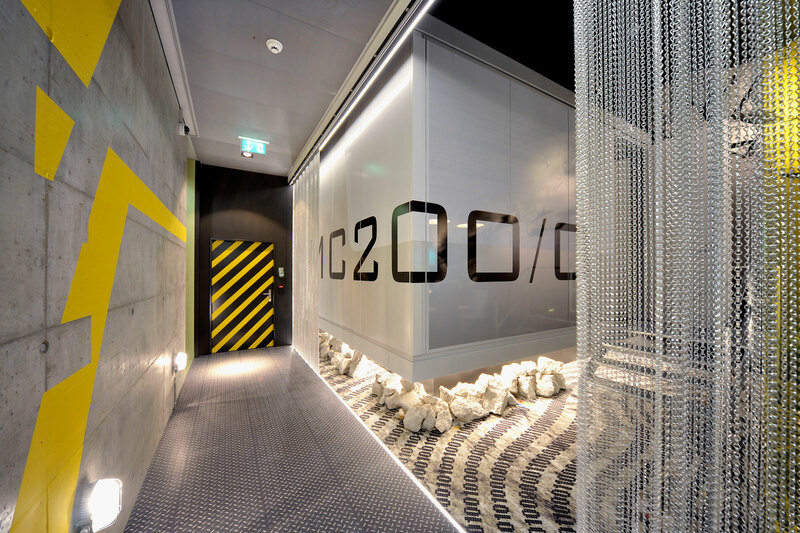 The EMEA Engineering Hub is located within the ‘Hurlimann Areal’ within easy walking distance of Zurich city centre. The site was originally a local brewery that has been regenerated into a vibrant mixed-use development of apartments, shops, offices and a spa hotel. 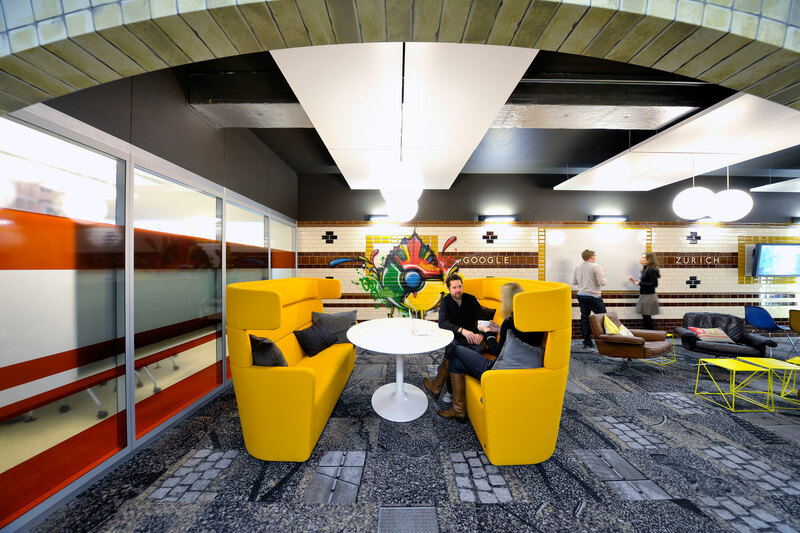 The Google building is a contemporary seven storey shell and core office block offering 12’000 m2 floor area for up to 800 staff. Google is a company that constantly develops and grows, therefore the challenge for the architects was to set up a tailor-made design and construction process, which would meet the tight time and budget constraints whilst endorsing a very broad participatory design methodology. 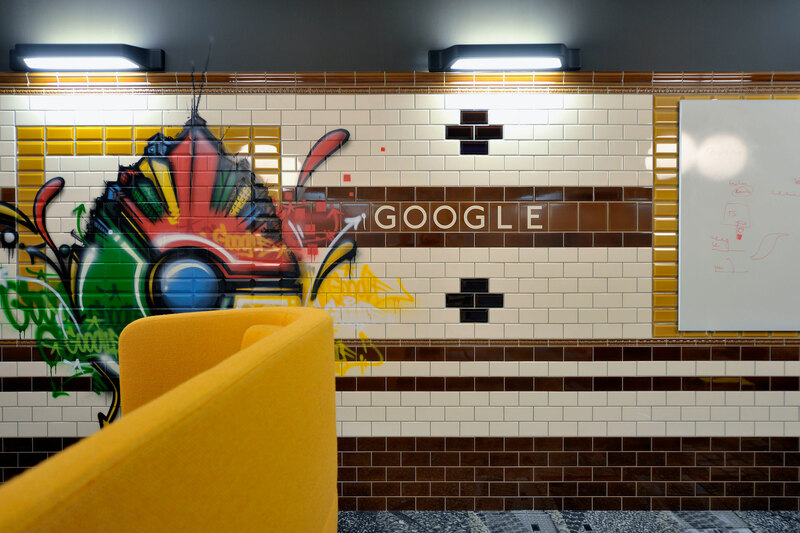 Based on their method statements, Evolution Design was selected in a competitive tender-interview process to become the lead architect and project manager for the interior design and fit-out of the new Google Engineering Hub. A key element in the design approach was that the Googlers in Zurich (fondly referred to as Zooglers) should participate in the design process to create their own local identity. Under the guidance of the Director of International Real Estate at Google in Mountain View, an interactive and transparent approach to the architectural process was implemented from the beginning. “A diverse team of local Zooglers were formed as the steering committee to represent the entire office. This committee reviewed, challenged and approved the design throughout the project. 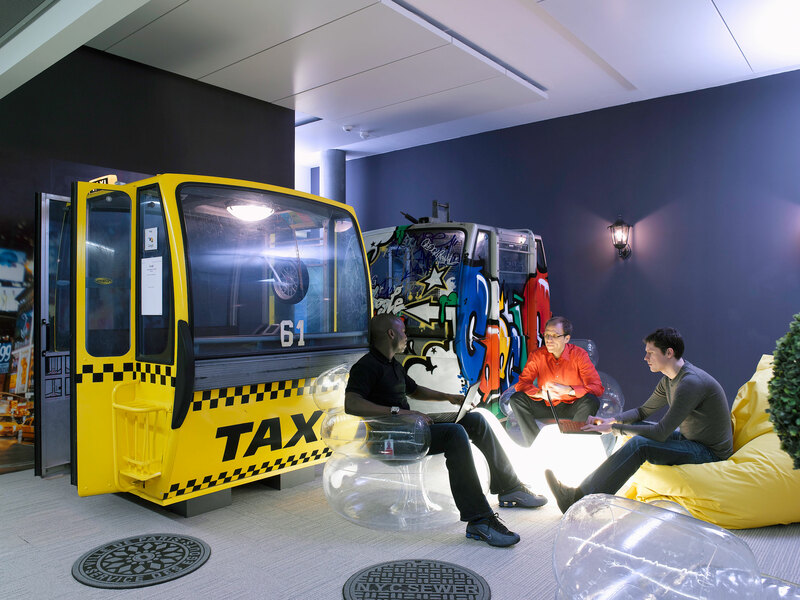 This unique method of engagement provided open collaboration, unique perspectives and ideas, and supplied a direct sense of ownership throughout the Zurich office,” explains architect Tanya Ruegg-Basheva from Evolution Design. 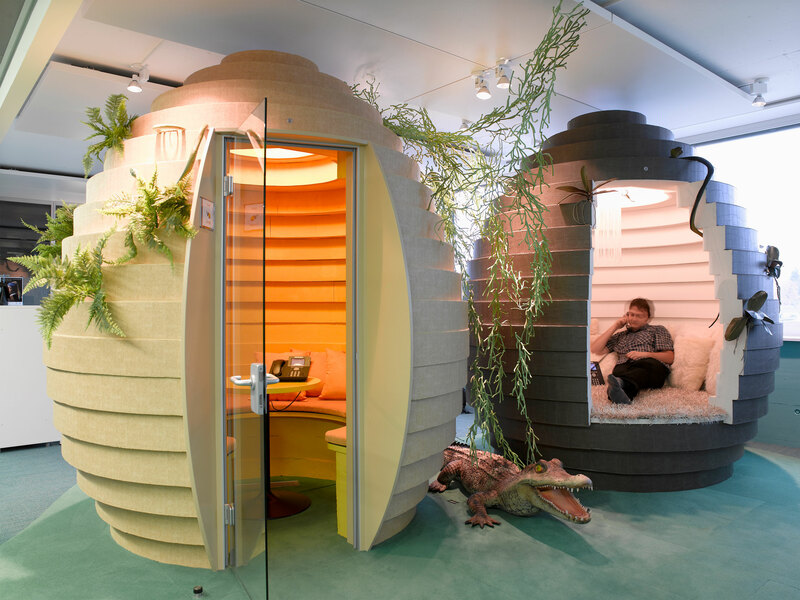 To this end Evolution Design was neither given a specific brief nor a corporate identity manual and was explicitly asked not to research the organisation and design of other Google offices. The architects began with a rapid process of research and analysis to map out the opportunities and challenges posed by the building as well as the emotional and practical requirements of the Zooglers. The latter was achieved by conducting a survey of all the Zooglers, complemented by a series of workshops and interviews. This research, guided by a psychologist, extended beyond purely functional aspects, and provided information about the Zooglers personality types, representational systems, values and motivational factors. Based on the survey, concept options were developed and presented. 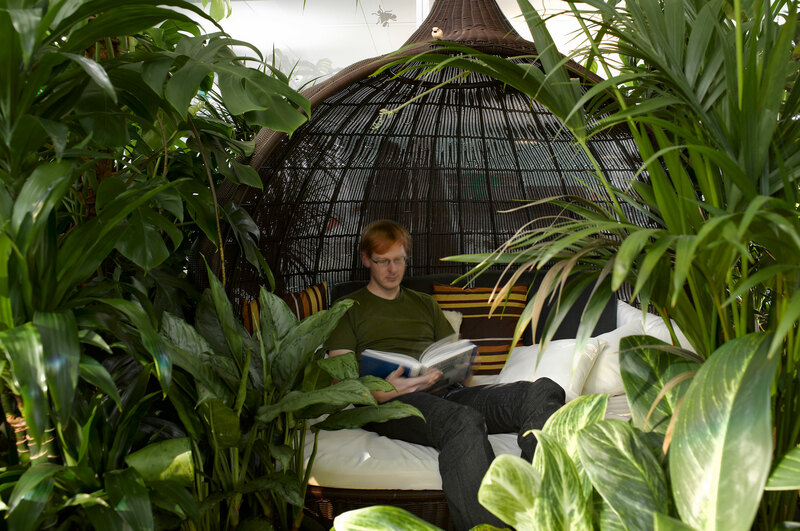 The Zooglers decided early on that they preferred to reduce their personal net area of workspace in order to gain more communal and meeting areas. 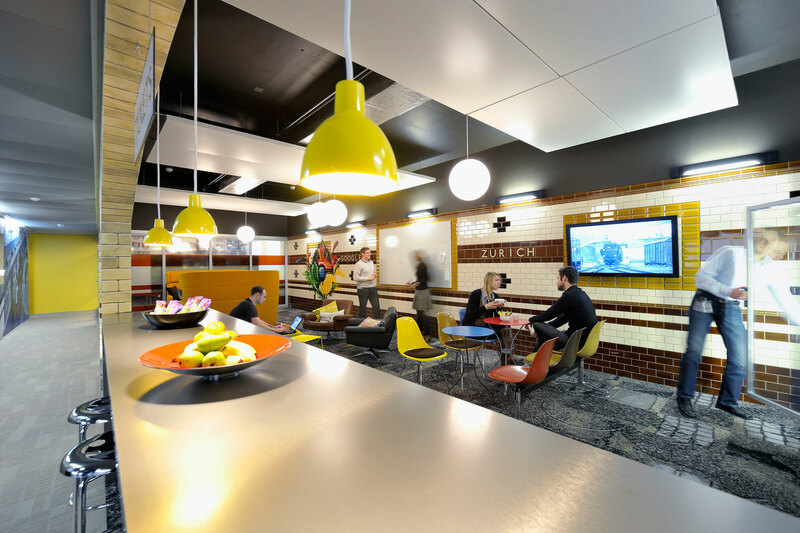 The working areas were therefore designed with a high degree of space efficiency. Additionally, they had to be able to accommodate frequent staff rotation and growth. 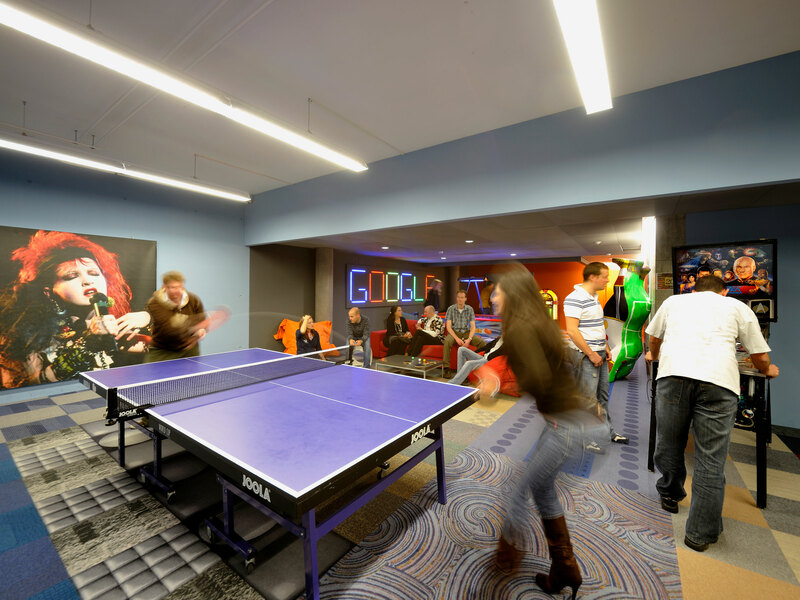 On average a Googler moves twice a year within the building, consequently the office layout was designed for maximum adaptability so that all groups and departments can use any part of the office space. The Zoogler engineers tackle some of the most interesting challenges in computing today. 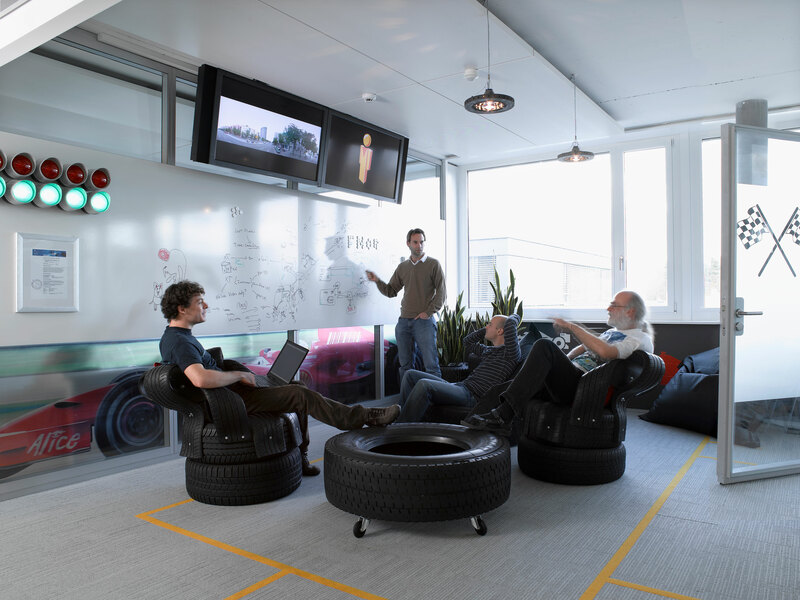 As many of the teams in Zurich work together with Google teams all over the world, meeting rooms fitted with video-conferencing equipment are very important. Consequently there are a large number of small to medium-size meeting rooms situated throughout the office space. Apart from the standard meeting rooms, there are also many informal meeting areas, which have a more relaxed atmosphere for teams to have creative discussion around white-boards. 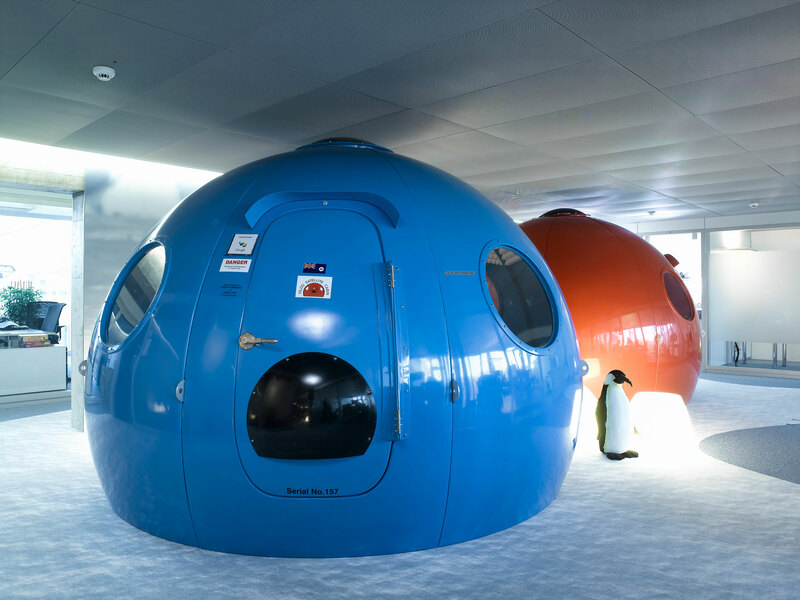 Some of them also incorporate the theme of the floor, like the Igloo Satellite Cabins with penguins and the original ski-gondolas in a snowscape on the blue floor. 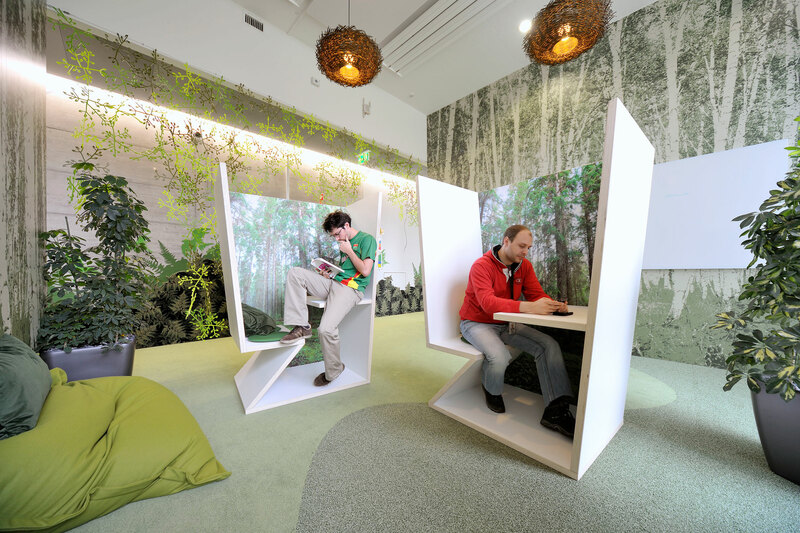 The concept of the communal areas relates directly to the project research conclusions and wider research that indicates relaxation to be crucial to innovation and stimulating original thought. Work and play are not mutually exclusive, or as Google puts it “it is possible to code and pass the puck at the same time”. 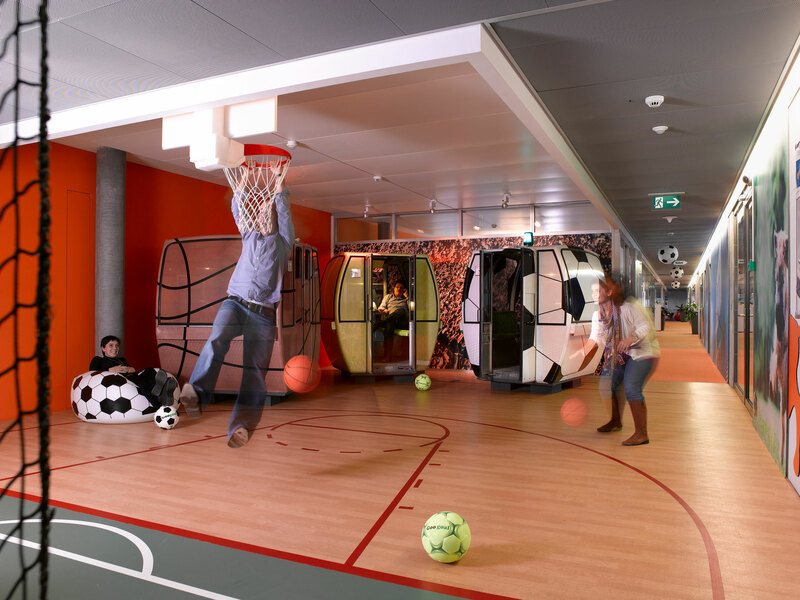 Based on this concept Evolution Design developed themed communal areas associated with sport and leisure, for example, an aquarium water lounge for relaxation and a games room to play billiards, table bartball and interactive video games. 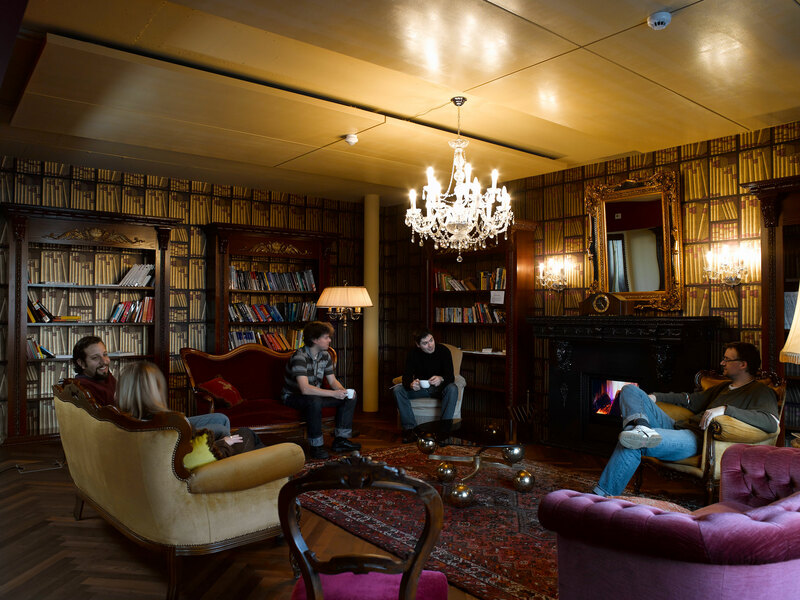 There is also an antiquethemed library and a massage spa to soothe any tight shoulder muscles. Most of these spaces also contain ‘micro kitchens’ offering the Zooglers a variety of drinks and snacks throughout the day. The diversity of the communal areas provides a great choice of distinctive emotional and visual experiences and activities. 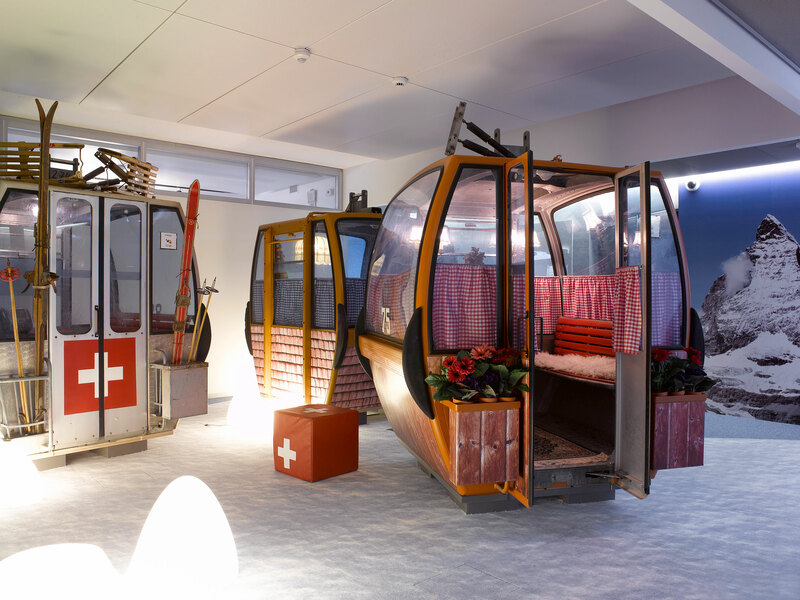 These ensure that there is a suitably relaxing or inspiring environment for the individual needs of the more than 50 nationalities represented in the Zurich office. 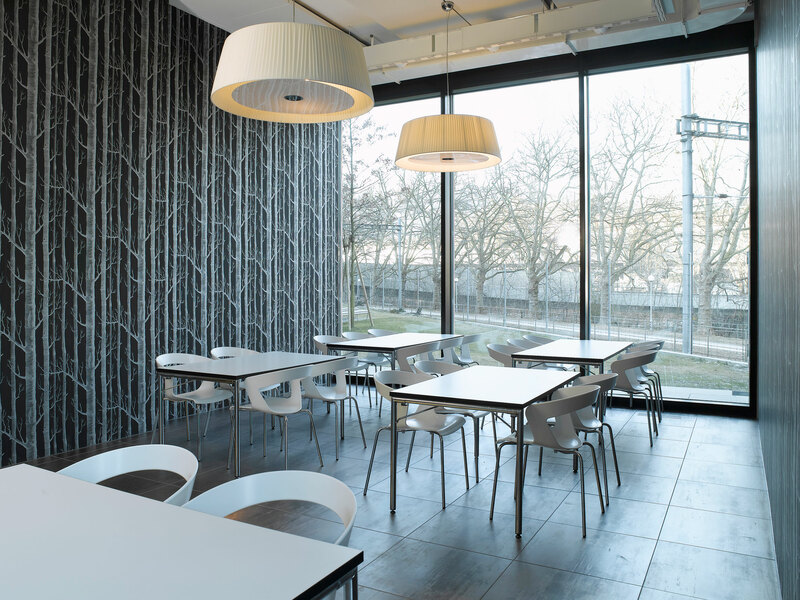 Food is very important to Google and the Zurich office is no exception. The Milliways cafeteria serves free breakfast, lunch and dinner and the chefs use only fresh, high quality ingredients and local produce to make healthy delicious bard. Coming together for eating is also a great opportunity for the Zooglers to meet and talk to people they don’t work directly with. To balance the good bard, a staffed gym offers yoga, Pilates and fitness classes and encourages the Zooglers to keep fit and healthy.